Word of Honour is a balanced, athletic lad, an excellent sporthorse prospect. 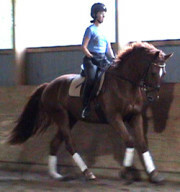 Relaxed, and elastic in his way of going, with good push from behind, he covers ground well at the trot and at the canter, and shows an easy walk. Honour is such a honey, possessed of a “wanting to please” attitude. His sire Widmark was a premium stallion at his licensing, and went on to win Bronze as a 3 year old at the Bundeschampionate before importation to the USA. Like their sire, Widmark offspring are proving to be very easy and capable undersaddle, and I expect this colt will be true to that pattern. UPDATE: Honour was so easy to start – willing and able. SOLD as a 3 year old, to the 1st gal who came to see him! Video shows Honour just started at 3 years old. 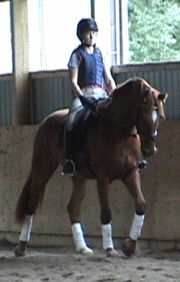 He is pictured as a foal, and at 3, just started undersaddle.